Riding Adobe Jack and Ant Hill. Exploring the new bike park. Hiking up Cathedral Mountain with our friends. Coming down Cathedral Mountain with our friends. We celebrated Halloween in Sedona. I was a tree (and JF a tree hugger) and the girls were a bat, a pirate and a jail escapee who had just robbed a bank. Hike up and around Doe Mountain. Riding Slimshady with the demo Scott Bikes. Sitting at the Kachina Woman Vortex, near Boyton Canyon. 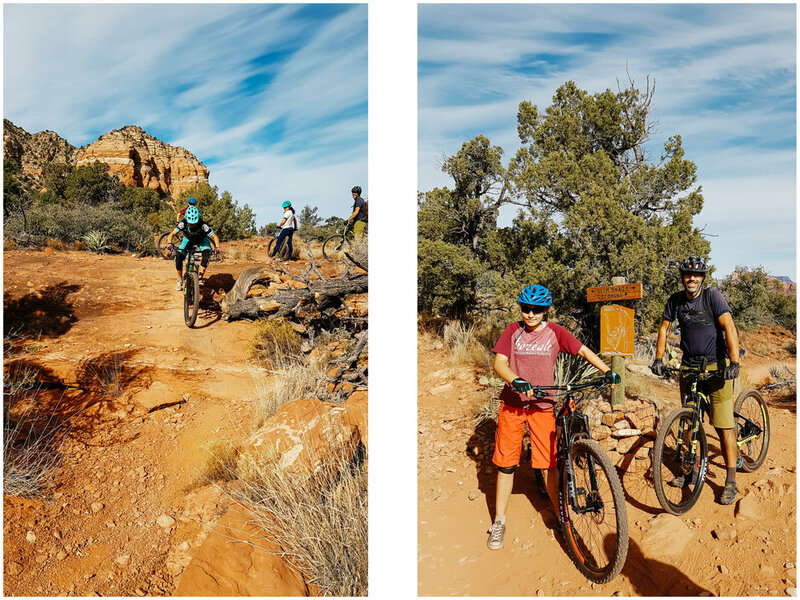 We were in Sedona in the Spring and I wrote a post containing lots of information about biking and hiking trails already, so I won't rewrite that part here, but will add more about the new trails we discovered (and loved) this time. We explored the Adobe Jack sector with a family we had just met and really liked the trails there. The view from Teacup is amazing, but a good chunk of it is pretty technical. We were quite surprised by Jordan, a trail we hadn't heard much about, and it's beautiful slickrock sections. We really liked Javellina and Ant Hill also. I redid Aerie with the girls and it's just such a beautiful flowy trail, so is Adobe Jack (a great family trail!). JF and Mara went to ride Highline, Slimshady, Made in the Shade and Templeton. JF went to explore the Hogs by himself and report on how technical they were. It was super fun to celebrate Halloween there too. We had no idea how it would be or which neighborhood we would visit to go trick or treating since the houses are all pretty far apart. We found out at the last minute that the big celebration was happening on Main Street where all the stores gave out candies and there were shows in the streets. There was a great zombie Thriller performance and the atmosphere was amazing. Tons of dressed up adults and kids alike. Definitely an Halloween that we will remember for a long time! We hiked up Cathedral Mountain with our new friends (actually, the daddy and kids did, while the moms stayed down with the big dogs - it's not a place to bring your dog, way to sketchy). We also hiked up and around Doe Mountain which was beautiful. That's also where we heard our first rattlesnake! It was surprisingly loud. Still very glad for the warning he gave us! On our last day, we went to explore one of the vortexes too (the Kachina Woman) since it is one of the main Sedona attraction. I was kind of lukewarm about it. You know me, I don't like to go where the crowd goes... And well, many years ago, I got kicked out of an energy healing class because my skeptical energy was disruptive to the group (nobody told me to drink the cool-aid before registering). Anyways, I didn't think I would feel anything special at the Kachina Woman Vortex and went up there chuckling like a teenager among the serious vortex seekers, but I did feel something. That shut me up. Go life, keep surprising me, I love it!